E. Lynn Harris’s impact on the literary scene is still felt after his death. 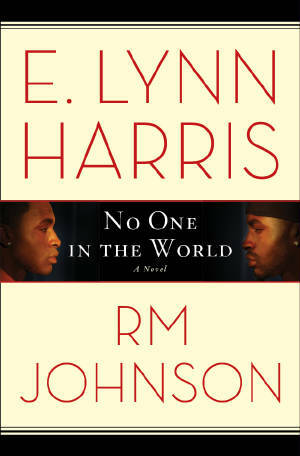 Fans of Harris’s books who are craving more can get more with his new book, No One In The World, which was co-wrote by RM Johnson. Johnson wrote The Harris Family, The Million Dollar Divorce, and Why Men Fear Marriage. Cobi Winslow, a handsome, well-educated district attorney, knows nothing about the life of his estranged twin brother Eric Reed, a career criminal raised by the foster care system. Following their parent’s death, Cobi searches and finds his brother in hopes to regain lost years. Soon thereafter, Eric’s former prison cell-mate, Blac, becomes entangled in the twins’ lives. Trouble quickly follows. Meanwhile, Cobi navigates the pressures of society as he lives a life in the closet. The stress comes to a head when he learns that in order to inherit the wealth of his father’s estate, and save the struggling family hair care business, he must marry a woman before the age of thirty-five. The seemingly impossible task becomes more difficult when Cobi’s sister suggests paying Austen Greer, the once successful, wealthy and extremely independent business woman to be his wife. After losing everything in the recession, in order to survive, Austen must consider the indecent proposal. Eric discovers Cobi is gay when he stumbles upon his brother during an intimate moment with a handsome senator. After promising Cobi secrecy, Eric entrusts the discovery with his ex-cell-mate, Blac. Blac endears himself to Cobi, in hopes of securing a $150,000 loan from him to pay back a debt racked by cocaine sales. As the clock expires on Blac’s efforts to pay his lethal debtor, and Cobi’s attempts to save the family company, rash moves are executed, family and friendship bonds are tested, and life altering sacrifices are made. Click on the link to pre-order your copy of No One in the World: A Novel (See all Multicultural Romance Books) . Tagged as Alfred Lord Tennyson, Books, Business, dl, down low, E-book, E. Lynn Harris, Eric Reed, Essence magazine, Essence.com, Foster care, Image Comics, Invisible Life, Jill Scott, Just As I Am, Nathan Edmondson, No One In The World, On the Down Low, RM Johnson, Shopping, Sookie Stackhouse, The Basketball Diaries, The Harris Family, The Million Dollar Divorce, Twin, Why Men Fear Marriage.